Here's a flower gardening tip (or two) that can add more flowering plants and more variety to your garden - at very little cost. Growing plants from seed is easy and is a great way to create an abundance of flowers in a bed or to fill in gaps amongst other plants. There is also the added advantage that plants grown from seeds are generally healthier and disease resistant. Now take this a step further! Make a decision to harvest your own seeds at the end of the flowering season. Leave the plants in a bit longer and wait for the seed pods to ripen on the plant. You'll see when the seeds are ready: Watch when the plant itself seems ready to disperse them and notice how the color of the seeds normally change from light to dark when they ripen. If you are planning to re-sow the same flowers in the same spot, you can simply help to break to pods open and scatter the seed. They will lay dormant until the next season. 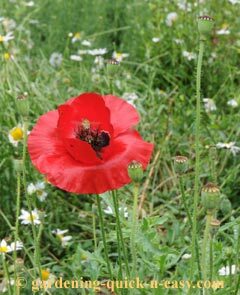 Alternatively, use a paper bag to collect the seeds, especially tiny ones such as poppy seeds. The best time to harvest is once the morning dew has evaporated and the plants are dry. Note: If the seeds are still moist after you've collected them, you need to leave them out to dry before putting them in a storage container. Be sure to label the container too with all the relevant information about the plant. Most seeds will last for a year at least after harvesting and some may last even longer. Another very easy way to multiply your plants is by plant division. It's as simple as vertically splitting off a clump - complete with the roots - from the mother plant. If you cannot prise apart the roots by hand, then use a sharp knife, spade or garden fork to cut through or separate the roots. 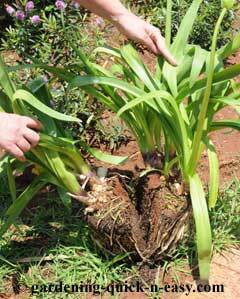 The important bit is to re-plant as soon as possible so the roots do not dry out. The best time to do division is during early spring. Don't be too greedy either - every 3-4 years is good, giving the plant time to become well established and robust before splitting off again. Having said that, we have often split plants bought from the nursery even before planting them the first time in a garden. The difference being that they were so abundant and well-cared for that we were positive they would continue to thrive. Put your home-grown seeds in a paper packet or envelope, find a picture of the flower if you can and paste it on the front and print the date and planting instructions on the back. It's also a great idea to make a note of the color of the flowers if applicable. Apart from gifting seeds you can also join a seed exchange scheme. It's easy to ship and you can exchange seeds with people from weird and wonderful locations. A 'baby' split off from your own plants makes another great gift. You can plant it in a simple container (biodegradeable containers are a good idea) and add a "Birth Certificate" - complete with place of origin, planting instructions and whatever story that may already be part of the plant. Plants received in this way often end up becoming heirloom plants, spanning many years with great stories about their origins and travels around many gardens.